Be my Valentine Loyalty Rewards!! Do you feel it, Messenger? February is here, and with it, the month of love! 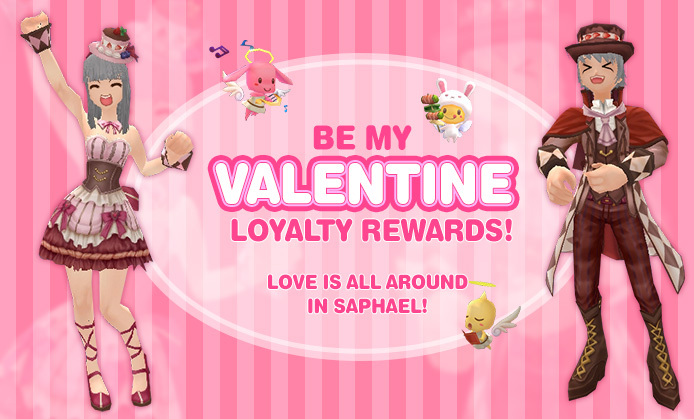 Be my Valentine Loyalty Rewards! if love doesn't make you fly like an angel, These amazing wings will! Make everyone fall in love with you! When is it? & how does it work?? Just come along and Spend AP in Grand Fantasia between the 8th and 12th is EXTENDED until Friday 15th of February and unlock free rewards thanks to our incredible Loyalty Programs! 5 Tiers where you can choose between these amazing costumes or the old and reliable Magic Alchemy Clay. You can unlock these Loyalty Rewards an UNLIMITED ammount of times. On the 6th Tier you will find the Game Master waiting for you to request your favorite Item as a >GM Wish<! !